Our Shop > Blog > What is a Pocket Folder? A pocket folder is a useful tool for keeping important documents organized, as well as presenting them to others in a professional way. Also known as “presentation folders,” pocket folders specifically include one or more pockets and may be made from paper, vinyl, or other materials. You might think that a product with such a simple definition would also be, by definition, a simple product. However, there is a greater level of complexity to pocket folders than just what’s on the surface. After all, a legal size folder with one right pocket and a tri-fold folder with three panel pockets would both fall under the definition of a pocket folder—even though both have different functions that serve different needs. Fortunately you don’t need to be familiar with every possible pocket folder on the market in order to make an informed purchasing decision. You only need a few key pieces of information to find the best pocket folder for you. The style of your pocket folder is about more than just the way it looks– it’s also about the way it functions. Bi-fold is the most common choice for a pocket folder because it folds in half like a book. However, you may prefer a tri-fold style that folds out into three panels like a pamphlet or flier. Tri-fold provides both additional storage space and a bigger canvas for your design. A portrait folder is held vertically, while a landscape folder is to be held horizontally. There has to be at least one pocket for it to be considered a pocket folder. Some folders will have only a single pocket, while others may contain multiple pockets to store many different materials at once. A pocket folder’s purpose will determine the required size. Some pocket folders have expandable pockets with reinforced edges so that you can fit as much material inside as possible. A letter sized pocket folder will fit documents sized 8 1/2″ by 11″ while a legal sized pocket folder fits documents sized 8 1/2″ by 14″. Since most documents are rectangular in shape, most folders have rectangular pockets to fit. 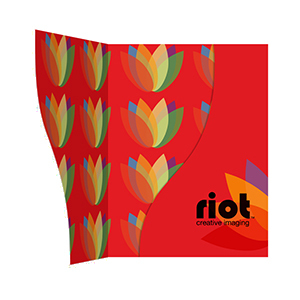 However, if you want your pocket folder to look stylish, or better fit a specific type of content, you can choose from many custom options including rounded pockets, vertical pockets and pockets cut into a serpentine shape. Just because it looks like a pocket doesn’t mean that it will always function the same way. Some pocket folders feature pockets that are attached with an adhesive for extra durability and storage capacity. However, there are also pocket folders where the pocket is an unattached flap, which provides you with a greater degree of accessibility to your files. What does a quality pocket folder have in common with a luxury car? Both can be loaded up with special features for the right price. 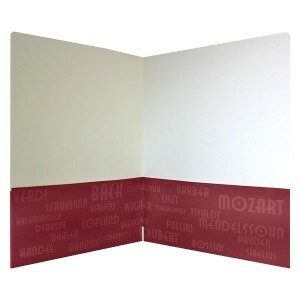 Pocket folder features may include a business card holder on the pocket or a window on the front that allows you to preview the contents inside. Tabs can also be added to a pocket for an added level of organization. Familiarizing yourself with the different varieties of file folders available will help you to always pick the best file folders for every occasion. Be sure to explore all of your available options and ask to see a few samples before making your final selections.